An enduring classic filled with humour, poignancy and terrific work by Anne Bancroft. 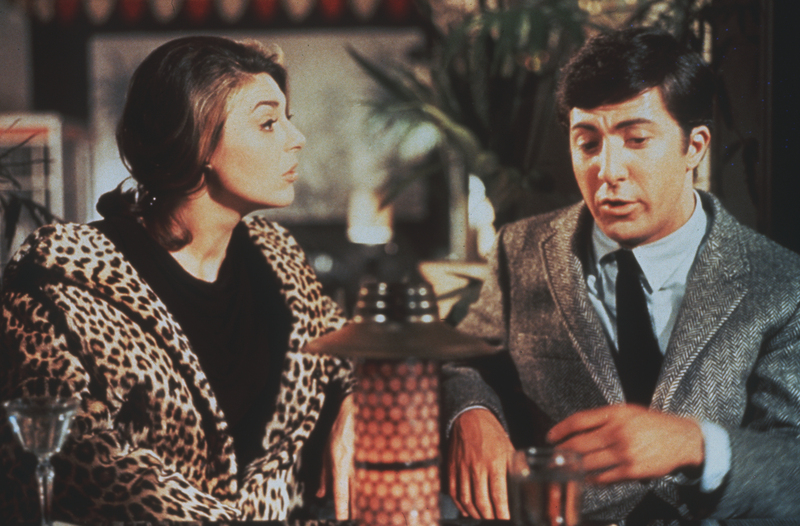 The Graduate is a rather special film; it remains biting and well observed despite being completely about its time. The performances by Katharine Ross and Dustin Hoffman are excellent; both giving different takes on America’s discontented youth in the 60’s, however it is Anne Bancroft who really excels here. She is perfectly cast as the seductress who lures in Hoffman, not just because she can handle the sexual aspect of her character well, but because she infuses every scene she has with fantastic depth and subtlety. The technical experimentation on show within the film has lost a little of its freshness in a way that say the techniques in Don’t Look Now have not, however this doesn’t really harm The Graduate much. Half of them still are really strong and interesting, and the rest just form part of the film’s overall individual tone. As to the film’s soundtrack… I’ll admit that it helps if you are a Simon and Garfunkel fan (which I am). The film is regularly punctuated by outbursts of various songs by the duo, the lyrics rarely truly comment upon the action and the songs are perhaps almost comical in their frequency. However, to complain about the use of Simon and Garfunkel strikes me as a little silly; it’s impossible to imagine one without the other, and what’s more I wouldn’t want to. There may be an overload but it’s all a part of the film’s charm. 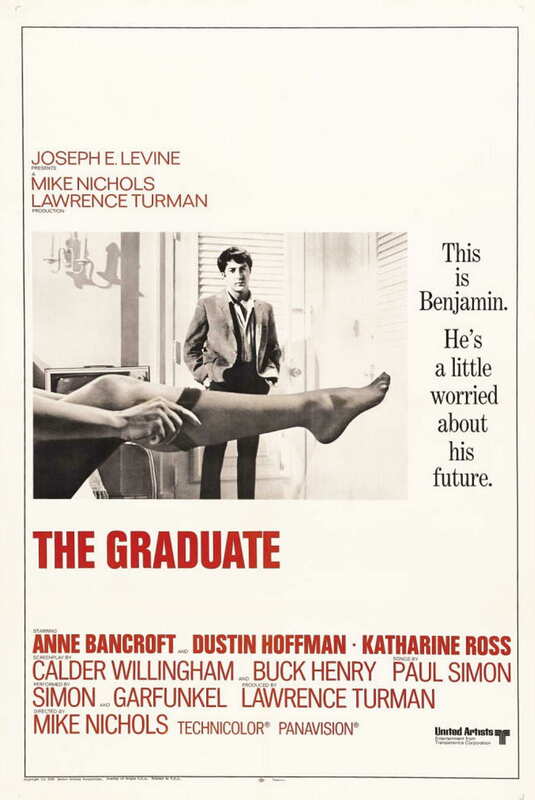 I do believe that The Graduate is one of those films which everyone really should see. It may be about its time but it is not of it; the humour still translates, everybody can relate to Benjamin Braddock’s uncertainty and disconcertedness and the key actors all deliver excellent work here. If for no other reason see the film for Bancroft. She delivers a wonderful performance; notable for both the extensive understanding she clearly has of her character, and for the skill with which she depicts that knowledge. It’s truly memorable. What is the film’s greatest strength? There’s a lot to pick and choose between but I might just go for Anne Bancroft. Its greatest weakness? It has to be the slight over use of Simon and Garfunkel, but this is definitely a minor criticism. Would I see it again? Without a doubt. I have already seen this one quite a number of times! I loved the soundtrack on this one but it just didn’t quite work for me. I didn’t really buy his relationship with her daughter. I love the soundtrack too, it’s just that it might be a little over done at times in my opinion! Hmmm I know what you mean but I don’t think that that relationship is meant to be too wholesome, it’s more a form of rebellion on their behalf. Just look at the uncertain looks they give each other at the very end. Great review Mr Rumsey. I’m about ready for re-watch on this one. Cheers – sounds good! I hope you enjoy it. Awesome review here James! I must say I have never seen this… sounds like I should be changing that! Why thank you Zoë! Yes, you definitely should! It seems that not everybody loves it, but it is really worth seeing regardless of whether you like it or not. I would love to hear your thoughts on it! I have added it to my weekend watch list! Oh great! I look forward to hearing your thoughts! I’m not the biggest fan of this film; thought it was meh. But, I agree on the cast. Bancroft and Hoffman are great, and I really like the music. Well I’m pleased to hear that we agree on some aspects here! I can understand people not liking the film itself, but I would struggle to understand if somebody told me that they hated Bancroft in this one!